If there was to be a revival of The Most Happy Fella on Broadway, Robert Creighton should be cast as the lead right now. I actually have no idea what the show is about, but what I do know is that at his concert and album release party at the Metropolitan Room February 13 for his debut record Ain’t We Got Fun, Creighton was the most gleeful guy in New York. In addition to covering for Joel Grey as Moonface Martin in the hit revival of Anything Goes when the actor was out due to an injury in the fall and having a baby with his wife soon after, Creighton kicked off the official release of his album by duetting on stage with Anything Goes original castmates Laura Osnes and Grey. Ain’t We Got Fun is a collection of jazz and Tin Pan Alley standards, as well as Creighton’s own compositions of the same style. If that genre of music gets your toes tapping, Creighton’s renditions will delight. If those tunes don’t float your boat, you’re still bound to enjoy Creighton as an entertainer because every performance is infused with characterization and his brand of clumsy, ‘aw shucks’ humor. And there was no shortage of that charm at Creighton’s concert. After kicking the show off with his own song “Crazy ‘Bout You,” Creighton explained that he was about to deliver his third baby. His first was the musical Cagney!, which he co-wrote and starred in in Florida. The second being his actual child and the third baby being the debut of his album. The title track from Creighton’s album was next, followed by a mashup of “Five Foot Two” and “Ain’t She Sweet,” which featured Creighton on a kazoo (a kazoo!). Showing a much-needed softer side, Creighton performed a graceful “My Buddy,” accompanied by a lone guitar. He then sang “Wrap Your Troubles In Dreams,” which featured extensive whistling. To complete Creighton’s trio of unorthodox instruments, he later performed half of “My Funny Valentine” on the lip trumpet, proving that he is a musical Swiss Army Knife. The evening reached a comedic height when Creighton was joined by his former Anything Goes castmate, Laura Osnes, who was the revival’s original Hope Harcourt. Osnes recently closed the failed Bonnie & Clyde, in which she gave a fiery performance that put her on Broadway’s A list. Here at the Metropolitan Room, she got to display her rarely-seen funny side along Creighton (a perfect partner to do it with) in his own composition “Fallin’ In Love.” In the song from Cagney!, the two are expressing their strong feelings for each other, but can’t quite bring themselves to say the L word. Creighton is delightful as he recoils each time the proclamation nears his lips, but it’s Osnes, seeming to gag on the word, who elicits the most squeals from the audience. Topping the night off for the audience, and especially for Creighton, was Grey’s spontaneous taking of the stage. He had been part of the audience the whole night, but only at the end did Creighton acknowledge his presence. The Oscar and Tony winner sprung to his feet, rushing up to Creighton to inspect the red and white striped socks he was wearing (an inside joke), and took the mic ready to sing with Creighton. Bemused with a ‘Well, why the hell not!’ attitude, Creighton took advantage of Grey’s willingness and instructed the band to play the duet they recorded for his album, George M. Cohan’s “Give My Regards To Broadway.” After some muffled reorganization from the band and Creighton, the two got off to a charming rendition of the most-appropriate song. Grey was gracious to his host, applauding and embracing him after they finished, leaving Creighton visibly shaken and giddy for his closing numbers. What did you think of Robert Creighton’s concert, Rushers? Which was your favorite performance of his? What else would you like to see him sing with Laura Osnes and Joel Grey? 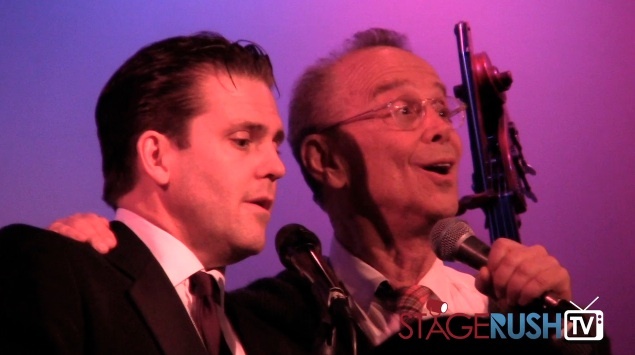 What other Broadway star should he duet with next? Leave your thoughts in the comments below!